So, if we eliminate UFO’s and rednecks, what’s left? Simultaneously fatal bird flu? High altitude hail? Jesus? Even supposing that we can narrow down the possibilities, it still does not explain the birds dying in other areas or the tens or thousands of dead fish. So what could possibly account for all of this? She has never, to my knowledge, launched a business or philanthropic venture without making sure her name appears prominently in the title. In 2004 she filmed a show in Africa titled Oprah’s Christmas Kindness, in which she highlighted the many challenges facing the continent. Oprah was so moved that she mobilized her charity “Oprah’s Angel Network” to raise money for relief. In 2007, she used this money to open the “Oprah Winfrey Leadership Academy for Girls” in South Africa. All of these events were chronicled in Oprah’s official publication, O: The Oprah Magazine which has never printed an issue in its 11 years of existence that did not have Oprah on the cover. In addition to the magazine, she launched her own XM Satellite Radio channel named Oprah Radio on which she airs her show Oprah and Friends. This year she launched her cable channel called O.W.N. (Oprah Winfrey Network) which will likely partner with her website Oprah.com in bringing child molesters to justice utilizing Oprah’s Child Predator Watch List. 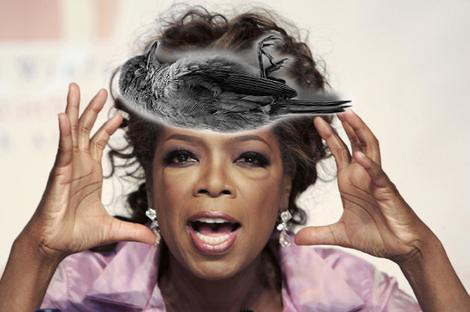 I fully recognize that Oprah generously donates millions of dollars to worthwhile charities for which she deserves our admiration, but is it really necessary to beat the general populace over the head with it by preceding every good thing you do with your name? Would fewer children be helped if it was called simply “The Angel Network” or “The Leadership Academy for Girls?” Do you have so many irons in the fire that you would forget it was your magazine unless your face was on it every single month? Cats and dogs living together...mass hysteria!